The perfect silhouette can immerse audiences into a story without ever revealing too much information. Silhouettes have been a huge part of cinema, but telling stories with shadows is nothing new. You can go all the way back to the Han Dynasty of China (between 206 B.C. and 220 A.D.) to find some of the earliest records of shadow puppets. 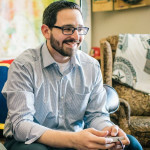 This ancient form of storytelling and entertainment has captured audiences for centuries. Many directors and cinematographers have made legendary film sequences using silhouettes. Here’s a look at how silhouettes can be used to create suspense, a feeling of isolation, or a romanticized view of the world. Perhaps the most prominent use of silhouettes come from the noir films of the 1940s and 50s. The French term film noir literally translates to black film or dark movie. Those Hollywood noir films were actually heavily influenced by the German Expressionism of the 1910s to 1930s. German silent cinema of that era was decades ahead of Hollywood. The Babelsberg Studio, located just outside of Berlin, is one of the oldest film studios in the world. 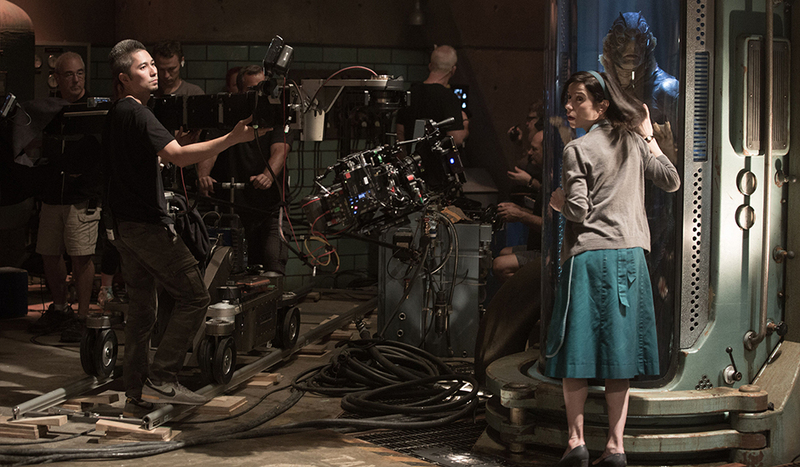 The studio began producing films in 1912, and was home to countless projects like Fritz Lang’s classic Metropolis. In 1924, Babelsberg collaborated with the UK studio Gainsborough Pictures on the film The Blackguard. That film was the first by Gainsborough to be produced abroad. To work on the film, they sent over assistant director and art director Alfred Hitchcock. German expressionism would be a huge part of Hitchcock’s signature style on countless films. The director’s use of silhouettes helped him earn the moniker The Master of Suspense. He frequently used the technique to focus the audience on a threat. 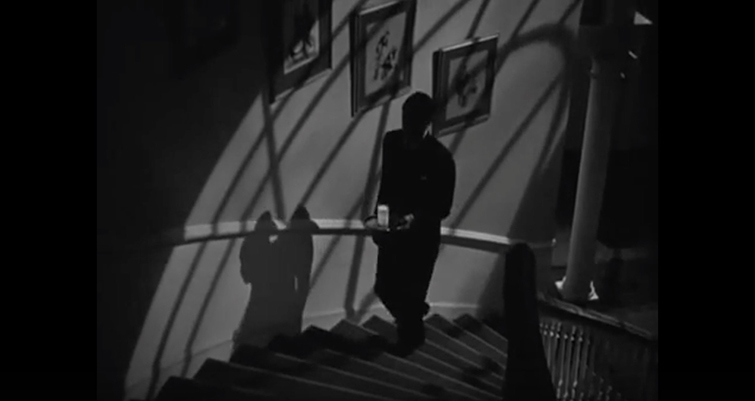 In 1941’s Suspicion, Hitchcock used a silhouette of actor Cary Grant carrying a glass of milk. Cinematographer Harry Stradling Sr. worked with Hitchcock to create this eerie image, which makes the audience wonder if the glass of milk is poisoned. This sequences cuts to a scene of Grant pressuring his co-star Joan Fontaine to drink the milk. Without the silhouette, the scene wouldn’t be nearly as ominous. 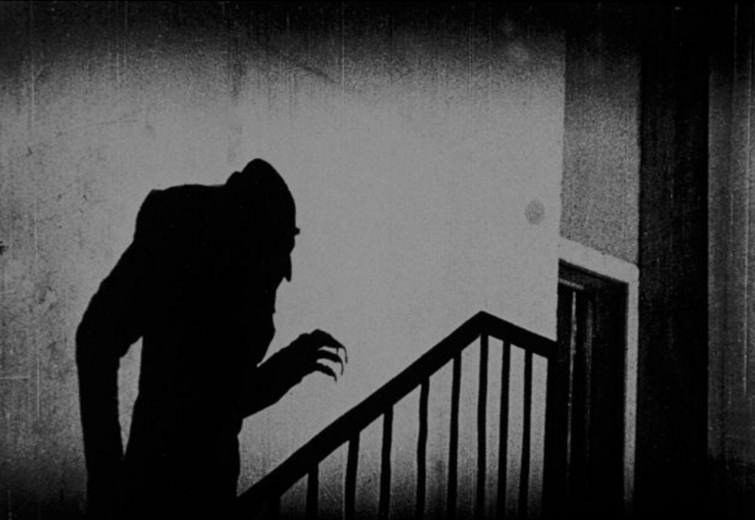 This particular Hitchcock silhouette pays homage to the 1922 German film Nosferatu, which featured the vampire Count Orlock creeping up a staircase. 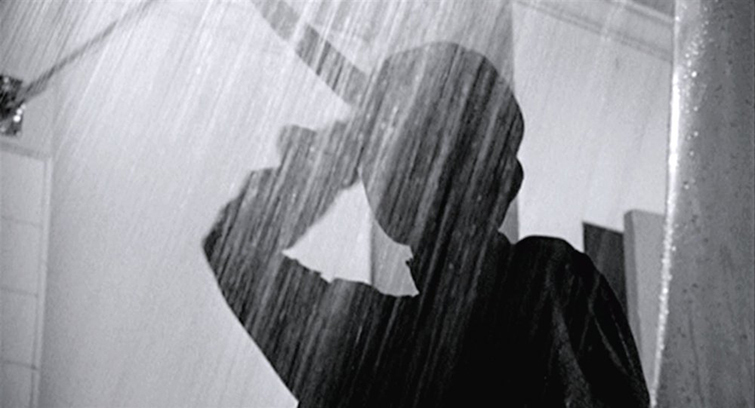 You can’t mention Hitchcock’s use of the silhouette without mentioning the legendary shower scene in Psycho. The entire sequence disguises the murderer in silhouette, failing to give the audience a real glimpse of the attacker. Image: The Assassination of Jesse James by the Coward Robert Ford via Warner Bros.
Cinematographer Roger Deakins could have an entire masterclass written just on his use of silhouettes. Many of his films feature at least one silhouette. When it comes to choosing when to use a silhouette, Deakins admits it comes down to instincts. 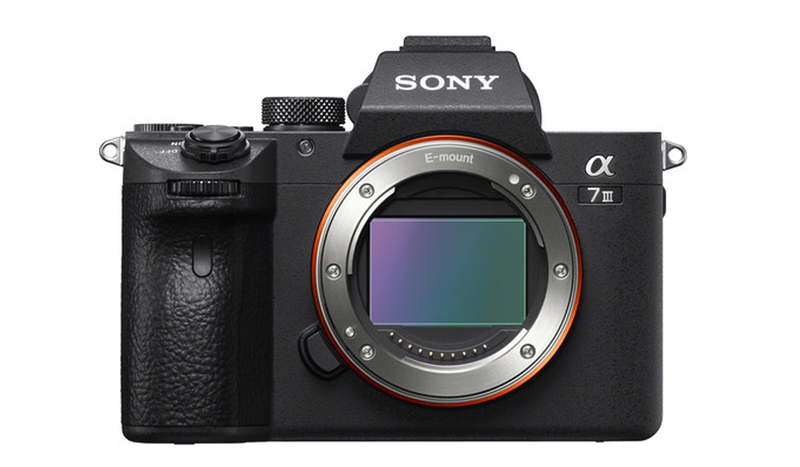 Deciding on the shot also comes down to the the circumstances of a character’s situation. More often that not, isolation is a key factor in Deakins’ silhouettes. Isolation doesn’t only mean that the character is alone. The feeling of loneliness can be portrayed with the right framing. In the below still from Jarhead, notice there are actually several Marines in the shot, but only one stands out by himself. 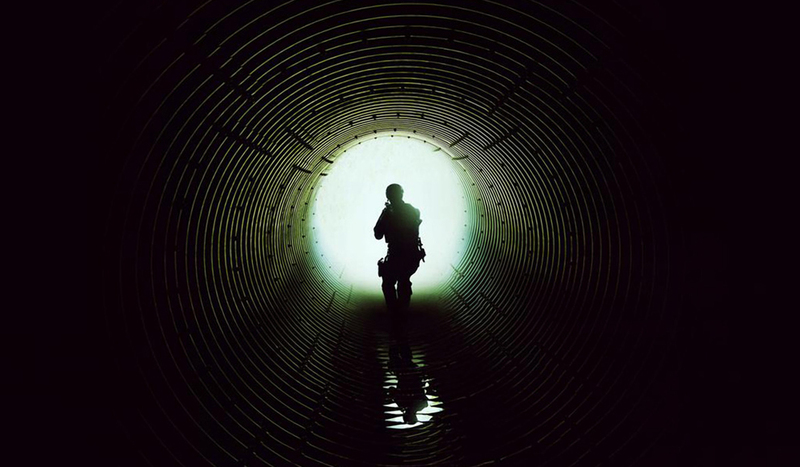 Deakins pulled off a similar shot in Sicario, however this time the audiences feels the isolation as they walk alongside Emily Blunt. Blunt plays an outside agent caught up in an operation against a drug cartel — an operation that the others want her being no part of. 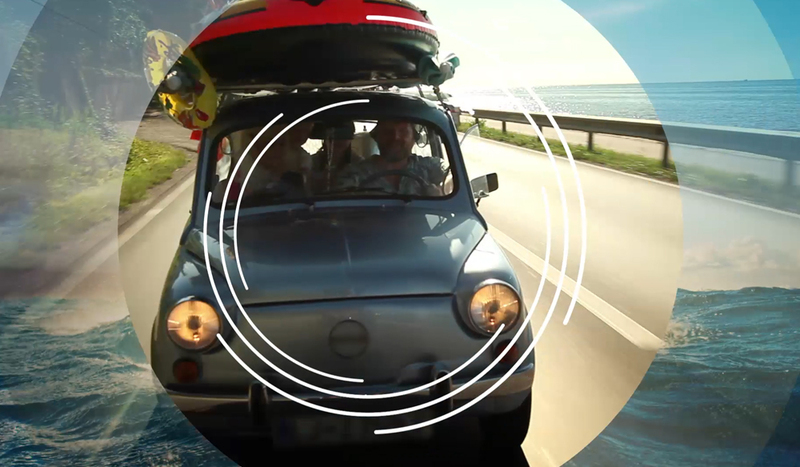 Like Deakins mentioned before, silhouettes can also be used to romanticize a moment. This isn’t merely referring to romantic relationships, but as a way a presenting images in an idealized way. Steven Spielberg is a director known for using silhouettes in a variety of situations. 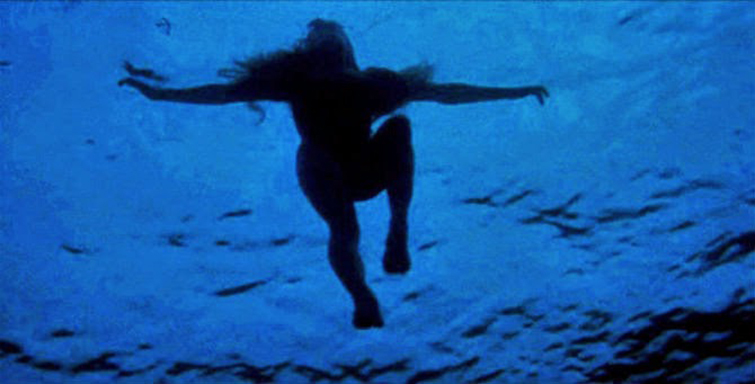 The blockbuster master used silhouettes to terrify people out of the water in Jaws. 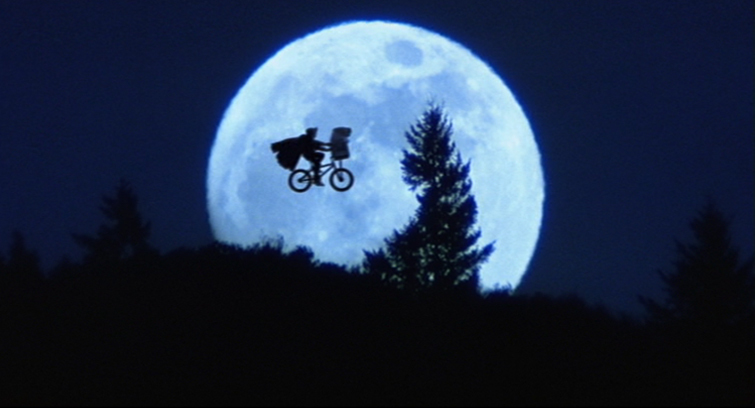 Spielberg whisked audiences to magical heights with his famous lunar flyby in E.T. the Extra-Terrestrial. 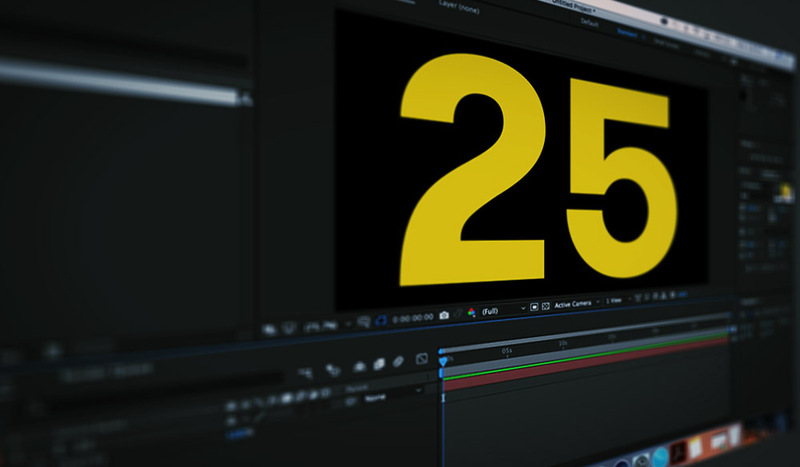 The silhouette was so instantly iconic, it became the director’s signature; the image now represents his production company, Amblin Entertainment. He made us feel the brutal heat of the desert sun in Raiders of the Lost Ark. 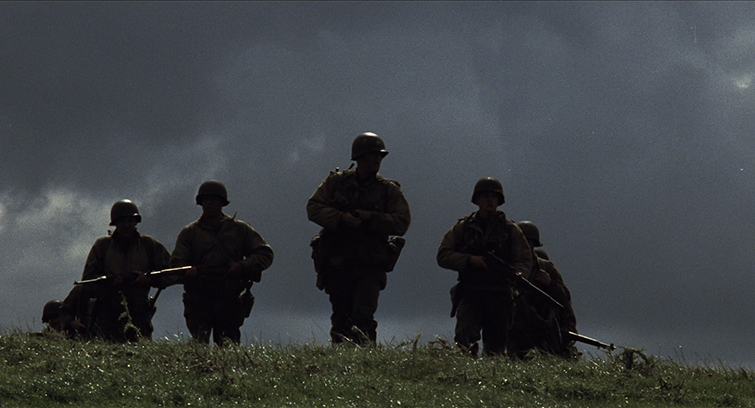 Spielberg even took audiences far across enemy lines in Saving Private Ryan, accentuating the impossible task of finding one unknown man among many armies. An examination of Spielberg’s work alone showcases the silhouette’s ability to transcend storytelling. His silhouettes evoke so much more than the image presents on screen. So many of his silhouettes have become iconic film images in their own right, proving the silhouette can not only set a mood — but define an entire film. As a cinematographer, you have many options when using a silhouette. You can easily use the technique to romanticize a moment or accentuate action. You can terrify audiences by building suspense or feel the isolation of a character. How do you like to use silhouettes? Let us know in the comments below.